Our puppet theatre performances use a variety of rod, hand, and string puppets and masks; and our repertoire draws on the myths and legends from world indigenous cultures, classics from our western tradition, and original stories told through a range of traditional and contemporary idioms. Masks are often associated with role and identity. Our concept of mask is based on the function that places 'inner' and 'outer' on an equal but sliding plane of visibility: on the dynamics between that which makes the visible, invisible and that which makes the invisible, visible. We use masks regularly, both in our puppet theatre performances and in our therapeutic work. We offer creative workshops in puppetry, puppet craft, and mask-making for children and adults. Workshops are hands-on and interactive, allowing for the imaginative and creative exploration of materials, technique, content, and performance. Wherever possible, recycled materials and found objects are used as building blocks. We offer dedicated therapeutic puppetry workshops for individuals and groups. Therapeutic puppetry explores the therapeutic and healing properties inherent in puppetry and puppet craft in order to promote wellbeing. 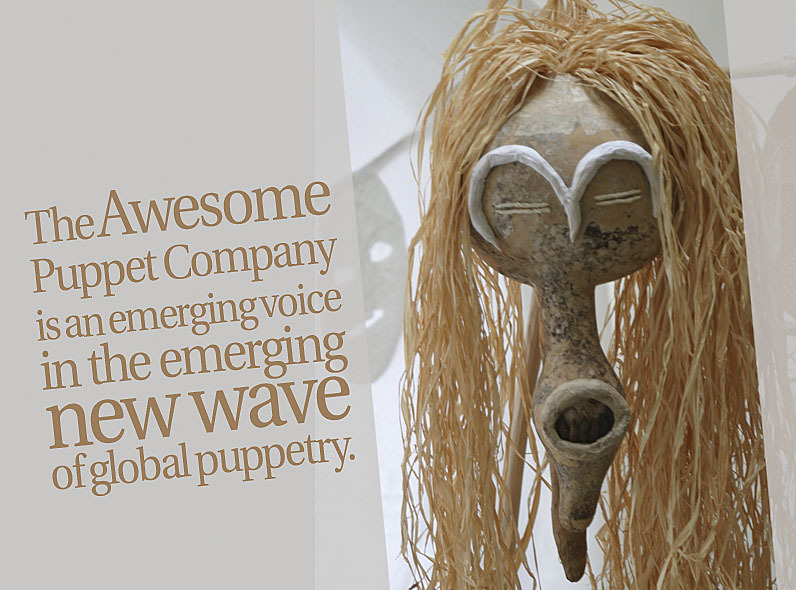 The work draws on the creative and performative elements of puppetry and puppet construction, mask-making, myth, storytelling, symbol, and metaphor. The therapeutic process draws out clients’ in-the-moment inspiration, spontaneity, and creativity as they follow their own compass.